Remove zinc coating if you use galvanized pipe. See Dealing with Zinc for ideas. 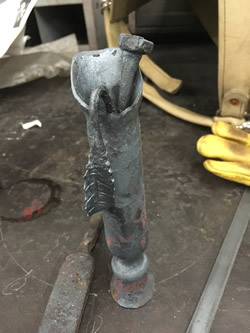 Heat, flair out the base end to make an attractive base (use ball peen over the anvil horn). Heat, fuller in an inch or so on the base end to make the throat of the vase. 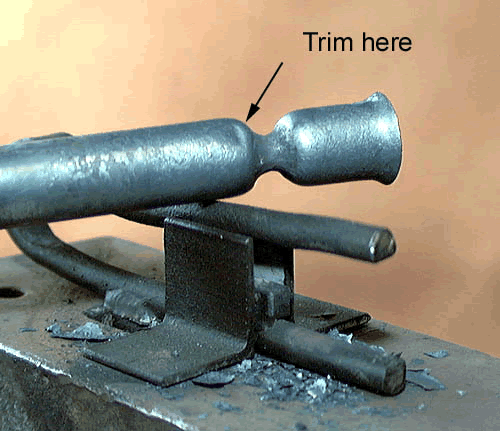 Heat, start working the angled end over the anvil horn with a ball peen hammer to begin curling the upper edge outward. Continue until you get it curled sufficiently, then using brushing strokes with your hammer curl the top point backward. Start at tail and work base over the horn with a ball peen the same way you did for the top of the vase to expand the base outward. Flatten the base on a belt sander making sure to get rid of any sharp edges. dip in muriatic acid (wear respirator and nitrile gloves, Caution: - Muriatic Acid is very dangerous and will have to be disposed of properly). 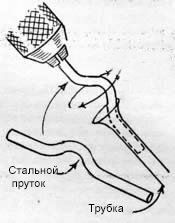 from pipe using a spring fuller (I use a guillotine fuller). I learned this version from Joe Brown at the Appalachian Center for Crafts. I'd forgotten about it, but I found 4 examples when I cleaned out a tool bag one day. It took me a minute or two to remember how they were made and it's probably simplier than my previous example. It's also safer since you can use "black pipe" and not have to worry about removing the zinc on galvanized pipe. 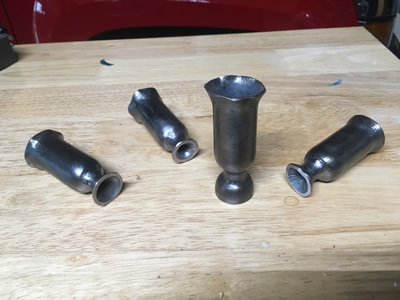 I've come up with several alternative tools to working the vase opening over the horn of the anvil. 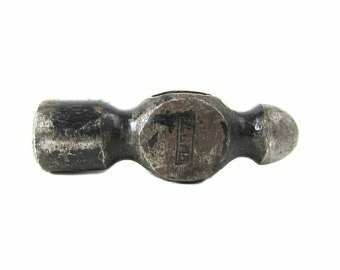 One is a hardy tool I made out of a ball pein hammer head and a second that is made out of a piece of rod. I've pictured them below.